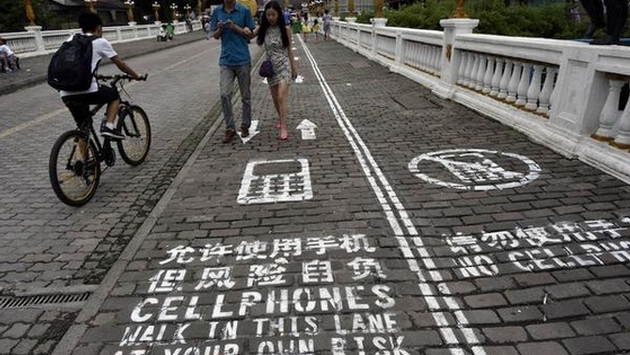 China nearly solved that people-texting-while-walking problem, corralling guilty parties onto a charming smartphone-only sidewalk. It’s like a highway for the truly self-involved. Engadget’s Mariella Moon spotted a wonderfully odd report at News.cn, profiling a country’s unique solution to a rather frustrating problem. Moon reports those texting and social-media exchanging on Foreigner Street in Chongqing city have a unique path to take. And here’s a closer look from BuzzFeed. Moon is careful to remind that Washington D.C. had a similar path painted for cellphone enthusiasts in July thanks to National Geographic’s Mind Over Masses show (h/t Yahoo!). Tang reports the Meixin Group, those that run the corresponding property, placed the painted area along a 50-meter portion of the sidewalk, not that it’s helped any. This should be fairly obvious to anyone who has tried to gain the attention of someone currently updating their Instagram feed. Essentially, anything short of a full fireworks display is useless. With that we have to say China missed on this one, very nearly solving one of the greatest scourges to walk this planet’s surface: people on their smartphones.